Workforce housing has always been in short supply in the Vail Valley. But where should that housing be built? 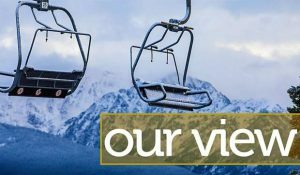 A number of residents of Eagle-Vail and East Vail in the past couple of years have said, firmly: Not here. The latest dust-up in the valley’s workforce housing location debate comes from Eagle-Vail. There, longtime area developer Bob Warner has proposed turning one of his office buildings at the intersection of U.S. Highway 6 and Eagle Road into a kind of boarding house for seasonal and short-term employees. Warner’s application to Eagle County proposes a total of 36 rooms — including one manager’s unit. According to the proposal submitted to Eagle County (which has land use jurisdiction in Eagle-Vail) the idea is for employers to master-lease bedrooms for their employees. The building is at a stoplight-controlled intersection. There’s a westbound bus stop directly across the street and an eastbound stop a half-block or so away. Looking at the location, and the plans for the building, this seems like a sensible place for housing. But before the proposal has had its first hearing in front of the Eagle County Planning Commission, several residents have already written letters to this newspaper opposing the idea. Letter-writers fear that short-term housing will bring crime, traffic and other woes. That, in their view, will degrade property values. Many of the same traffic and crime canards were tossed about by several neighborhood residents when the Interstate 70 half-interchange at Eagle-Vail was still in the planning stages. The end product seems to have been a benefit to the community. When Vail Resorts in 2017 proposed rezoning an East Vail parcel just north of the I-70 interchange there, some residents complained that workforce housing on the site would bring undesirable elements to the neighborhood. Consider, too, that the same “not in my back yard” sentiment also temporarily derailed a large project in Gypsum. Again, some critics feared the project would bring “undesirables” into their neighborhood. All of the above leads to today’s question: Given the need, where should workforce housing be built? It’s a serious question, deserving of carefully considered answers. “Somewhere besides here” isn’t a valid response. The need for workforce housing is real, and it’s acute. All of us, throughout the valley, need to understand that addressing the problem is going to result in meeting some new neighbors.